I've managed to upload most of my pictures from my recent trip to Utath. 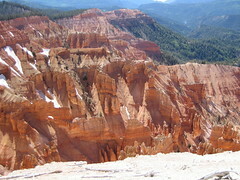 There's a photo set I created for Cedar Breaks which shows off some of the red rocks near Parowan. Also, on one of the first days of the 2005 Parowan trip, Harry and I took a ride with Charlie Hayes in his Cessna 182. We visited several small airports that are along the common XC routes in the area. Those photos, not yet annotated, are in my Parowan Air Tour set. As usual, you've taken some great pictures.